The Android Basic builds require an active Internet connection; however, if the JEB license is current, we allow a much longer grace period before requesting a connection with our licensing server. This is to take care of scenarios where the connectivity would drop for a relatively extended period of time on either end. Most interestingly, expired licenses of all types may now be used past their expiration date to reload and work on existing JDB2. New projects cannot be created with expired licenses though. In terms of features, JEB 2.3.11 includes upgrades to our ARM64, MIPS64 and x86-64 parsers 2, as well as fixes and additions to the DEX parser. One interesting update, which prompted writing this blog post, is the support of DEX 39 opcodes. Version 39 of the DEX format will be supported with the release of Android P 3. DEX 38 had been introduced to support Oreo’s new opcodes related to dynamic programming. We wrote a lengthy post about them on this very blog. The new instructions const-method-handle and const-method-types are natural additions to retrieve method handles (basically, the same as a function pointer in C, a concept foreign to the JVM until lambdas and functional-style programming made its way into the language) and method prototypes. Those opcodes simply query into the prototypes and handles pools. The deadborn extended set used FF as an extension code to address 2-byte opcodes (FFxx); they were defined but unimplemented in Ice Cream Sandwich, and removed soon after in Jelly Bean. 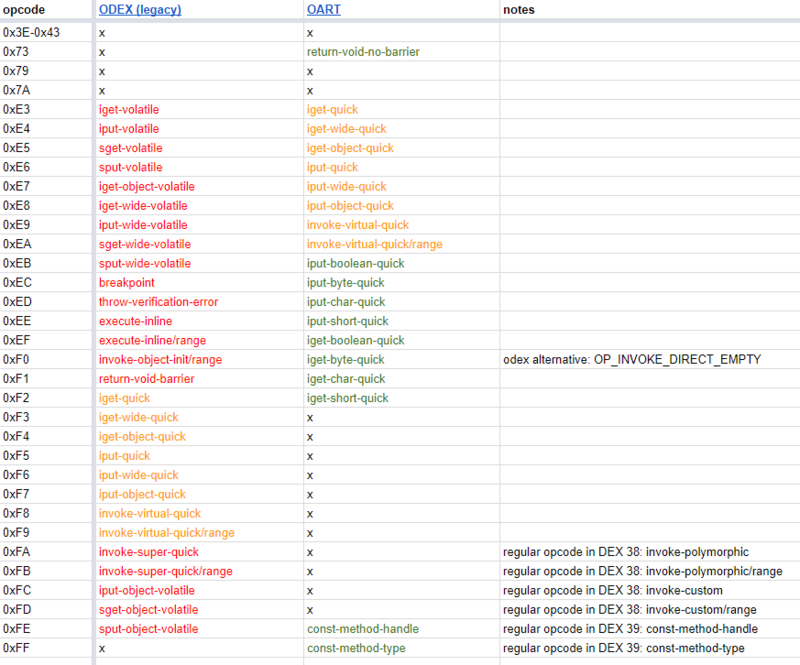 For DEX files with version 38 or above, or that are part of an OAT ELF file, the newer ART set will be used. That’s it for today’s DEX clarifications. Remember to upgrade to JEB 2.3.11. On a side-note, let us know if you’d like to be part of our group of early testers: those users receive beta builds ahead of time (eg, JEB 2.3.12-beta this week).